FLEGT Voluntary Partnership Agreements (VPAs) aim to verify and license legal timber for export to the EU in order to create a ‘market access’ incentive for legal operators and countries that wish to improve forest law enforcement and governance standards. Licensing is based on a Legality Assurance System (LAS), which is underpinned by a national Legality Definition. Beginning a credible domestic stakeholder process to identify appropriate laws and detailed verifiers for compliance are necessary pre-requisites to formal bilateral negotiations with the EU. and all relevant management requirements be examined. 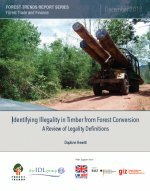 On this basis, in the countries reviewed in detail by Forest Trends, a significant majority of the conversion timber produced appears to be illegal. This paper therefore reviews the Legality Definitions of the six counties engaged in VPA implementation, with a view to determining the potential that they offer for identifying illegality in wood sourced from conversion of forest to non-forest uses.